The latest digital writing tablet from Kent Displays started shipping this week. 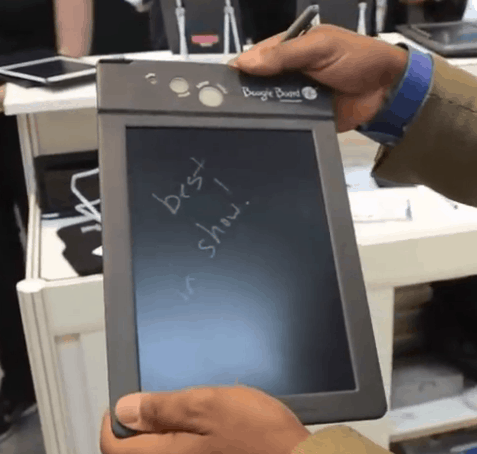 The Boogie Board Rip was unveiled just over 2 months ago, and it 's just the latest model to use Kent Display's unique low-power LCD screen tech. The idea behind the Boogie Board is that you can write, draw, or scribble on it with a stylus or your finger. The screen will hold the contents without using electricity. The only energy cost is when you blank the screen and remove the current scribbles. Now, the original Boogie Board lacked an important feature that I'd been wanting ever since I first heard about the device. It couldn't save the contents of the screen. That features was missed by a number of users, which led Kent Displays to develop the Boogie Board Rip. This tablet can save what you scribble on the screen as a PDF, and the device has space for about 200 single page PDFs. Edit: I just got the press release, and the Boogie Board Rip tablet is also going to have a nifty little Windows app to help it out. it's called the Virtual Desktop Companion, and when the BB Rip is plugged into your PC you can draw on the Rip tablet and use the app to see your sketches in realtime. It might not be obvious, but Kent Displaysjust quietly released a Wacom tablet competitor. I'm looking forward to seeing how well it works. The Boogie Board Rip is shipping now from Improv Electronics. Retail is $130. I've never had my hands on it, but take a look at the demo video that follows and you'll agree that it's a neat gadget. It’s a lot more expensive than the original boogie board. The original boogie board works perfectly for our purposes. Though, if this one had been available back then, I’d probably have ordered one original and one rip, instead of two originals. Having the BoogieBoard double as a drawing tablet suddenly makes the product much more interesting. I couldn’t understand how anyone would really want to spend $130 on something like this, given that the original can be purchased at any Brookstone at every mall in the US for less than $40. Playing with the original at a store shows that the technology has a lot of potential. The biggest flaw was certainly the inability to store your scribbles. However, as an artist I enjoyed the fact that the screen registered pressure so that the harder I pressed, the heavier the pen stroke on the screen. My daughter picked one up and proceeded to play with it for about 20 minutes. I do wish that there was more contrast on the screen though. Regardless, I hope the product is successful and hopefully the price will come down a bit after some time. how to synch with computer? How to save as pdf in computer?